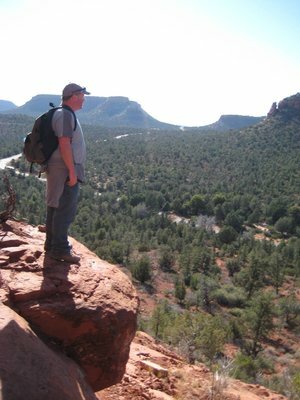 Hiking in Flagstaff and Sedona, Arizona, and trying to avoid the crystal-using, sandal-wearing hippies searching for mystic enlightenment at the many earth-energy vortices. View Phoenix Rising From The Flame on GregW's travel map. 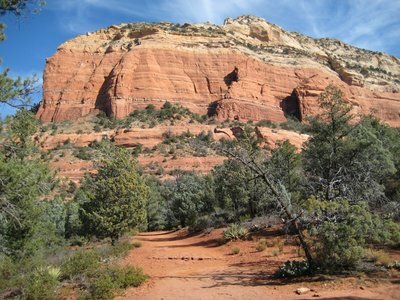 For my first weekend in Arizona, I decided to leave the hot, dry warmth of the desert around Phoenix and head north to the cool, thin air of Flagstaff and Sedona. 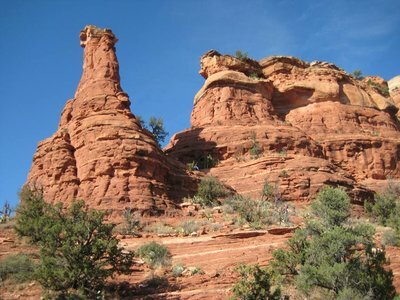 As one heads north from Phoenix, you rise up, gaining significant altitude as you climb up to the Colorado Plateau. The area has drastic rises and dips in altitude, and driving through the area you can easily find yourself climbing from 4,000 feet to 8,000 feet above sea level. 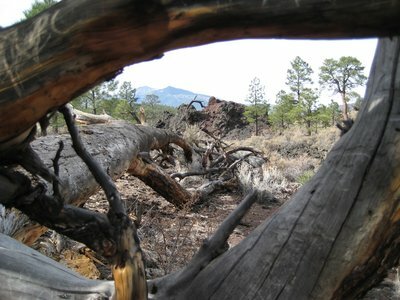 Just outside Flagstaff are the San Francisco Peaks, the highest mountain range in Arizona, including Humphreys Peak, at 12,637 feet above sea level the highest point in Arizona. I made the weekend trip up to Flagstaff with a coworker of mine. 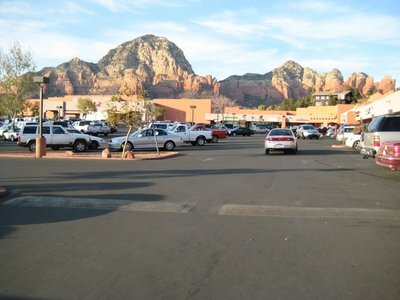 Sedona is the more scenic of the two towns, but also the more popular, so to save money I found myself staying in Flagstaff at a Radisson Hotel on Route 66. Route 66, also known as the Mother Road is a highway that runs from Chicago, Illinois to Santa Monica, California. Or, more correctly, Route 66 is the highway that USED to run along that route. The highway was slowly decommissioned over the years, until the last portion was official decertified in 1985. Despite not really existing, the highway still lives on in the imagination of the American public, in many ways thanks to the famous "Get your Kicks on Route 66" song composed by Bobby Troup and recorded by many artists. 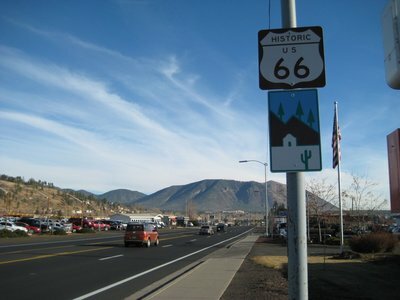 Many states have jumped upon this nostalgia to declare old portions of the highway "Historic Route 66" and try and draw in tourists. Obviously it works, as I took the above picture in a somewhat giddy state, despite knowing that the modern 4-lane road that I was taking a picture of probably was never Route 66 at all. Flagstaff is a university town, home to Northern Arizona University, and on Friday night we went out to a Thai restaurant that was teeming with NAU students, attracted by the cheap but good Thai food. 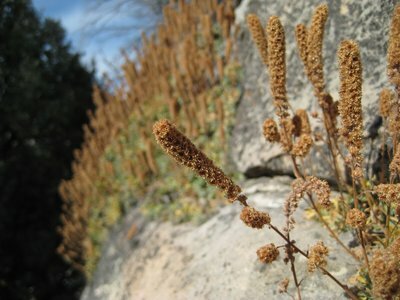 Saturday was a beautiful day, sunny with temperatures in the low teens Celsius, good weather for hiking. 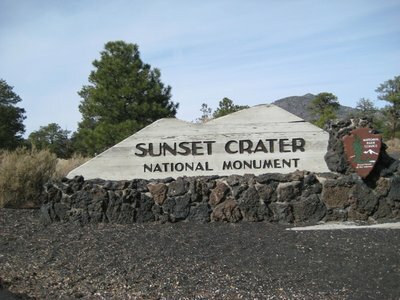 We started the day heading to Sunset Crater Volcano National Monument. 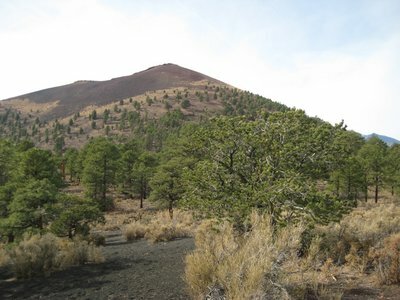 Sunset Crater is a volcano that first erupted in 1064 and last erupted in 1100. Nothing since, but I kept my car keys handy in case we needed to make a quick escape. 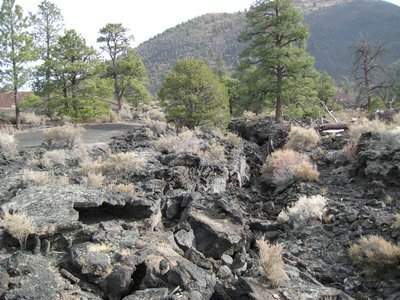 The landscape around the crater is black, volcanic rock, porous but hard. 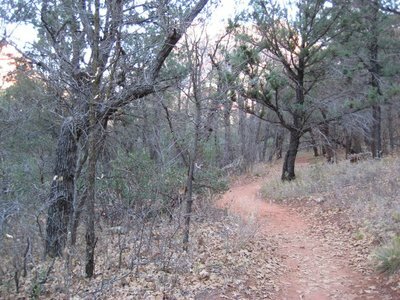 While many of the roads are paved, to get to some of the many national and state parks around Flagstaff and Sedona, one has to take some of the Forest Roads, which are pretty rough. 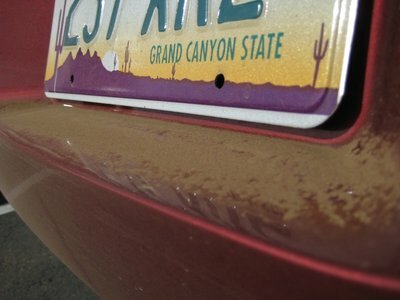 By the end of weekend, my car was covered with a thick layer of red dust. 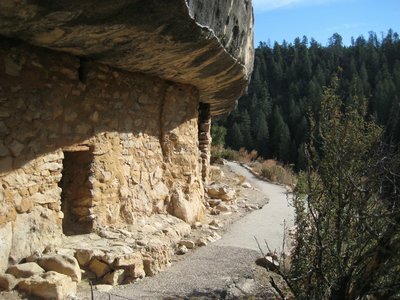 The next place to visit was Walnut Canyon. 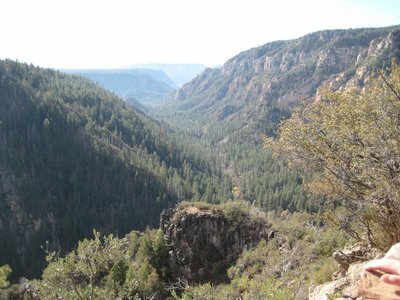 Walnut Canyon National Monument is a 350 foot deep canyon (dropping from 6,690 ft to 6,340 ft) that used to be home to the Sinagua people. 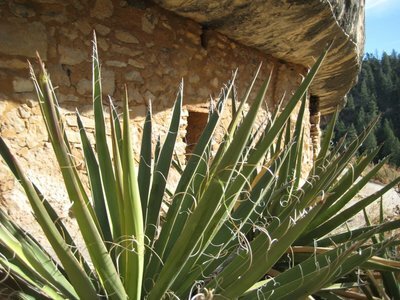 The Sinagua built they homes in along the cliff faces, in small caves that were bricked up to provide shelter from the wind and snow of winter. 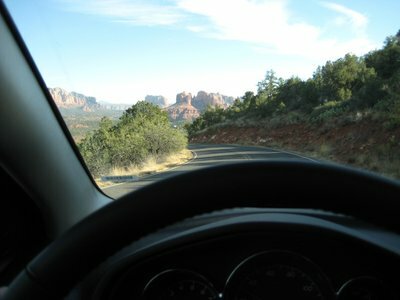 Next up, we drove South to Sedona. 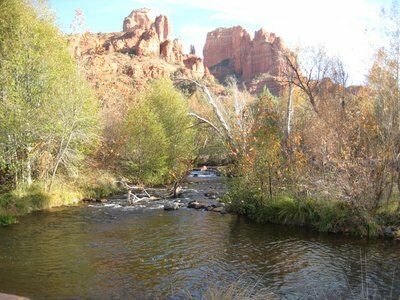 The drive from Flagstaff to Sedona goes through the Oak Creek Canyon. The canyon is a 12 mile long river gorge which is impressively deep, especially when you consider that it was carved by something labelled a creek. 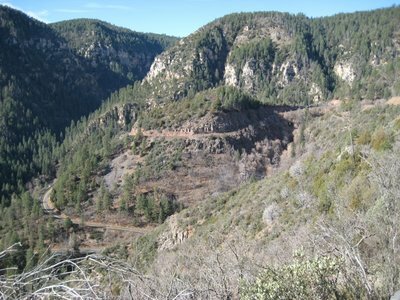 Highway 89A runs through the canyon, and there is a very cool and fun to drive portion that switchbacks back and forth down the canyon wall before curving and snaking through the tree lined canyon floor. 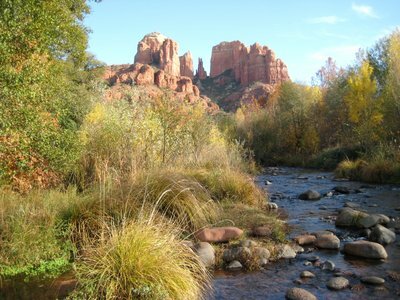 Sedona itself is beautiful, voted by USA Today as the most scenic place in the entire USA. Even the view from the mini-mall parking lot is stunning. 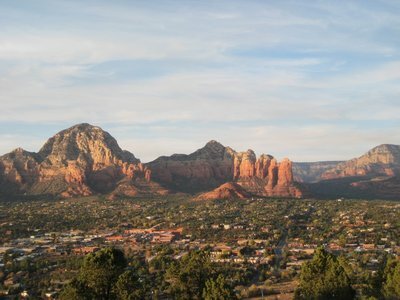 The Sedona airport stands atop a cliff, and from a viewpoint just outside the airport, you get a good idea of what the town looks like, and why it is home to some of the most expensive real estate in Arizona. 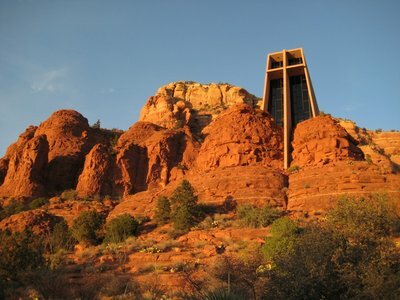 About 3 miles from the centre of Sedona is the iconic Chapel of Holy Cross, designed by Frank Lloyd Wright student Brunswig Staude and built in 1956, is a Catholic chapel built into the surrounding mesas. It is especially awe-inspiring in the sunset, when the entire building is lit by the beautiful dusk light. 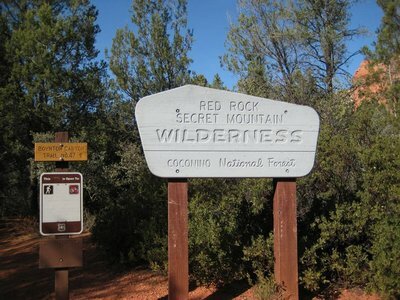 West of the town centre, down the Upper Red Rock road is Crescent Moon ranch. 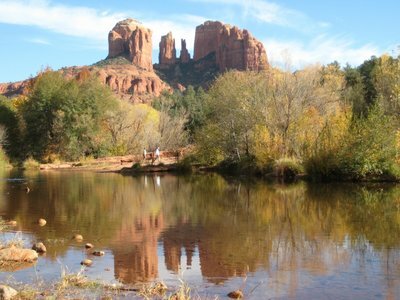 It isn't a ranch any more, but now a picnic area which offers some of the best photo ops of the nearby Cathedral Rock, especially when you can catch it reflected in Oak Creek. The above is the picture everyone tries to get, but there are so many amazing views of the Cathedral Rock, it's hard not to walk away from Crescent Moon with 100 pictures of the same mountain off in the distance. 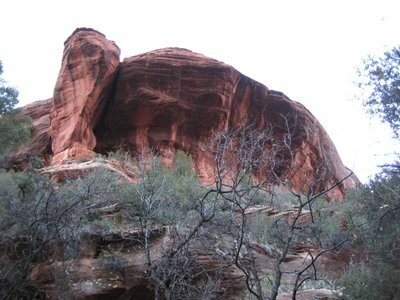 Everyone once in a while, if you can tear yourself away from staring at Cathedral Rock, there is also some pretty bits in the picnic area as well. 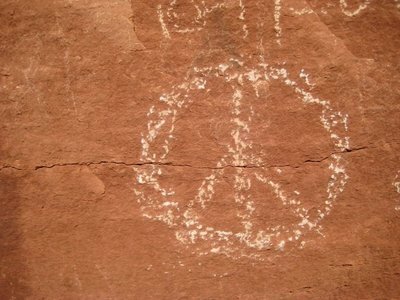 There are lots of hippies in Sedona. 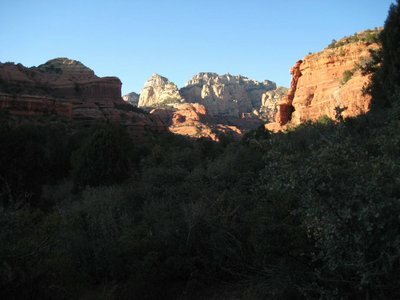 This is apparently because there are "energy vortexes" in Sedona. Aside: Some of you may be asking "Hey Greg, shouldn't that be vortices?" 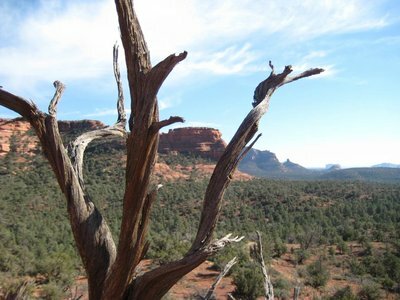 No, apparently in Sedona the plural of vortex is vortexes. Don't ask me why, I'm no granola-eating, sandal-wearing, crystal-worshipping hippie. 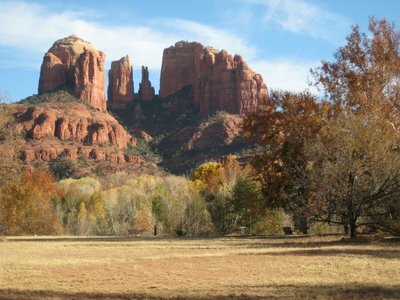 If you google "Sedona Vortex" you will find a near endless supply of information on the vortexes, and the Sedona tourist board even gets in on the trip, printing up maps of where the most powerful vortexes are. These "spiraling spiritual energy" sights are, apparently, places where the "energy is right to facilitate prayer, mediation and healing," so tells me about.com. 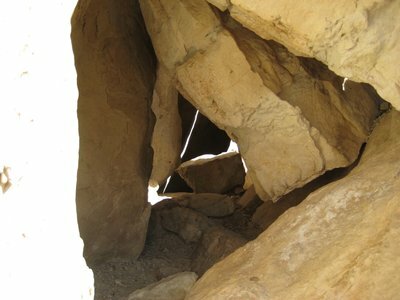 The site goes on to say that "Vortex sites are believed to be locations having energy flow that exists on multiple dimensions. The energy of the vortexes interacts with a person’s inner self." Anyway, you can tell that I am not one who really buys into this, but lots of people do, and at least I should try and be accepting of their beliefs, so I will try and not be too dismissive throughout this entry. 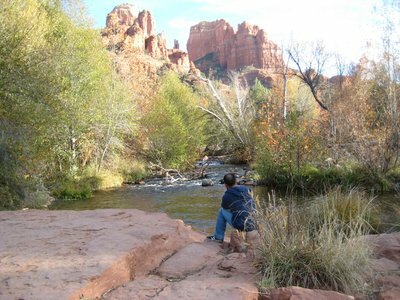 Though the Crescent Moon Ranch is not a sight of a vortex, it, like all of Sedona, is a place where spiritual energy is high, and people often find themselves sitting, soaking up the energy and contemplating existence and meta-existence. 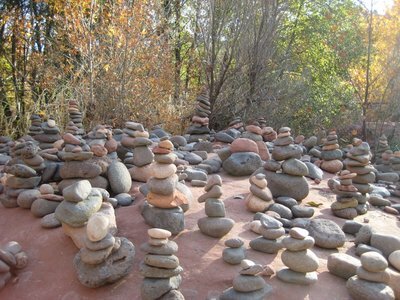 Stacking rocks, like the Inuit who stack rocks into Inuksuk, is very popular among the vortex visiting set, and there was one place in particular in Crescent Moon where folks seemed inspired to stack. 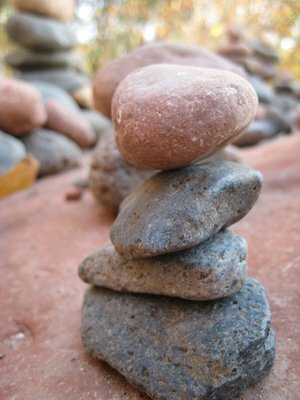 I figured I would try and get into the spirit of things, and created my own stack. I dunno what that did. Perhaps my Chi energy is now more balanced or something. I'll let you know if I feel more centred or something this week, but that evening, I had dinner at Buffalo Wild Wings, drinking beer and watching college football, which would suggest that I haven't progressed much on a spiritual level from any other weekend. Sunday, after a decent sleep and a big breakfast, we headed out for two big hikes. 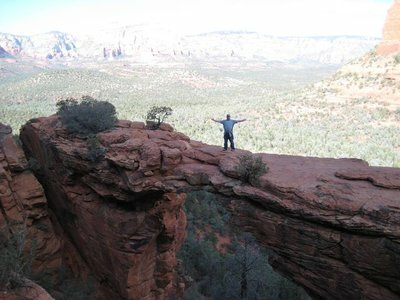 First up was a hike up to the Devil's Bridge. 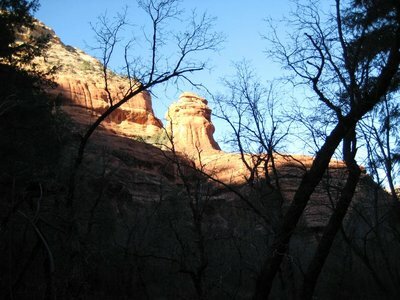 Devil's Bridge is a natural sandstone rock arch just north of Sedona. 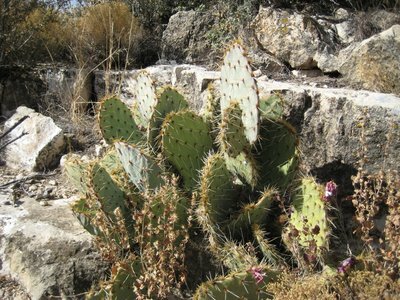 The hike up to the sight is 1.8 miles, classified as an "easy" hike, but there is a 400 foot climb in altitude from 4,600 up to 5,000 feet, so it can be a little tasking on the lungs. Arriving at the arch, though, is worth any breathlessness from the climb. The view of the Devil's Bridge is pretty spectacular as well, looking across a large, flat valley to cliffs rising in the distance. It is worth taking a moment to sit and enjoy the view. 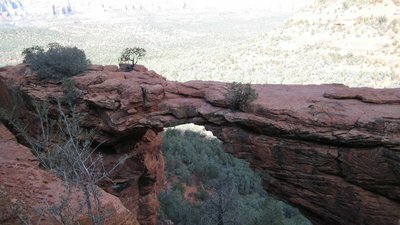 From Devil's Bridge, we did the Boynton Canyon trail. 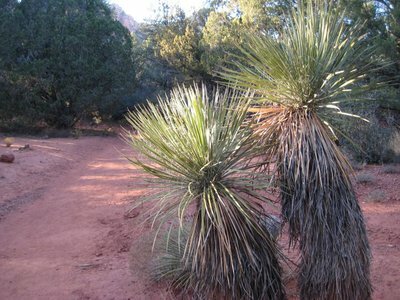 The trail starts off in what many would consider typical, south-western geography - with desert sands, low brush, giant red-rocks and hot sun. 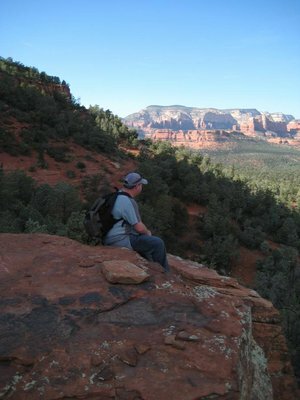 As the canyon walls start to get higher above you, and closer together, the environment changes. 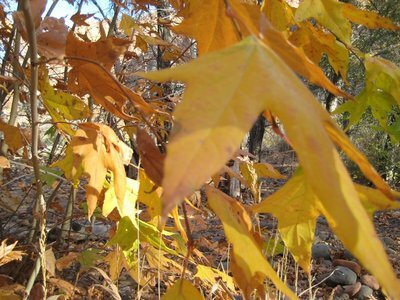 It is colder, darker and wetter, with tall trees and a lot more vegetation. 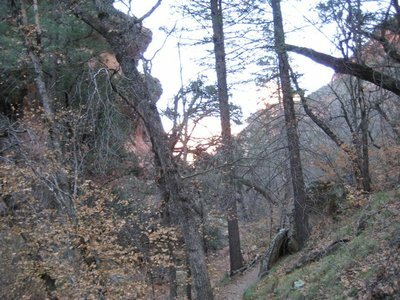 The trail is 2.5 miles long, and again classified as easy. 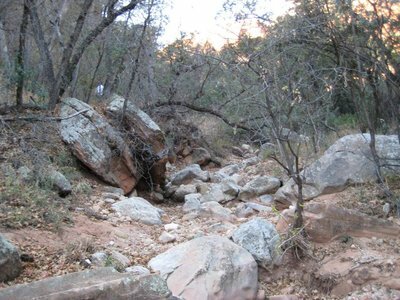 I found myself struggling up the rise, as most of it seems to come at the very end of the trail as it climbs from the floor of the box canyon up to the side of the canyon. 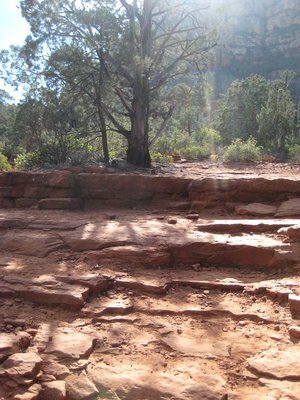 The end of the path is one of the many vortexes in the Sedona area. I sat quietly and tried to feel the energy, but didn't quite manage it. 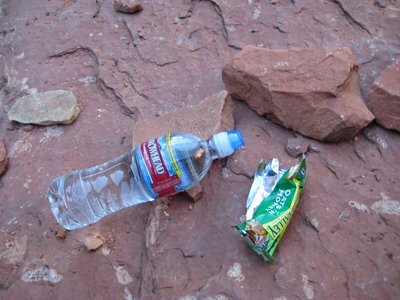 After hiking for more than 2 hours (including a detour to climb up the Vista Trail to see the Boynton pillar), I was really just hungry, thirsty and out of breath. Instead of finding spiritual or emotional enlightenment, I just found a granola bar and a bottle of water to refresh myself and sat quietly trying to catch my breath and enjoy the view. 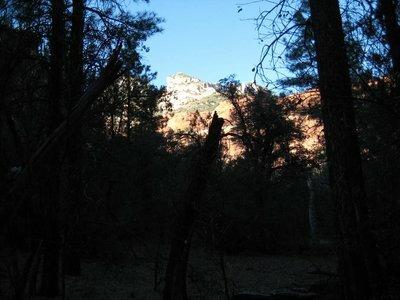 On the way back, the sun is setting and the canyon floor is in darkness. 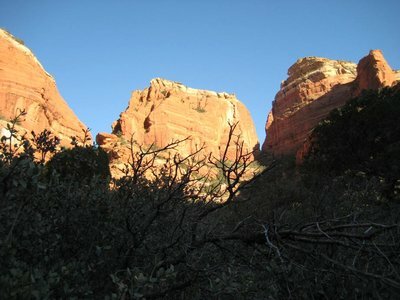 The sun lights up the cliff faces above us creating some amazing views, making it hard to keep your focus on the path. 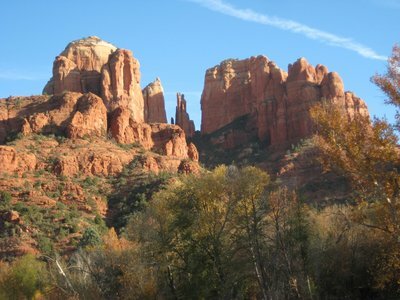 So I have now returned from Sedona, a place of apparent cosmic energy that gives many guidance on their path in life. I never found any lasting peace, just the temporary peace from the beautiful views, a good days exercise and the fresh (if somewhat thin) air. Looks like a blast! Too bad I won't get outside of the Phoenix metro area this time around. It's okay though, I'm headed to Barcelona next month and I give you full permission to feel a little jealous! Great photos! 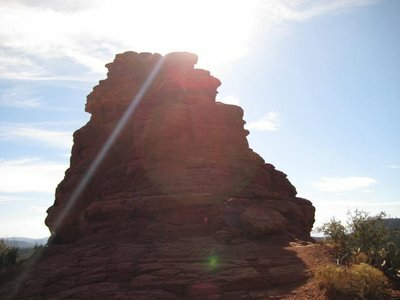 Really enjoyed seeing the rock formations in that light. Would be great to hear more about this route 66. I only heard of it through music, movies etc. Never had a clue it was decommissioned?! !